Download 1/3 of the book for free (below). This workbook can help you navigate through the mental healthcare maze, find competent healthcare, and recover within 90 days. 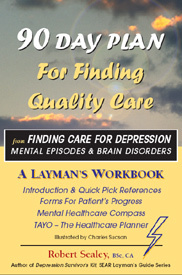 Use TAYO - the Healthcare Planner - to Think About Your Options (PDF). A mental healthcare compass that helps you to navigate through the healthcare maze to reach accurate diagnosis and restorative treatment. Download 1/3 of the book for free. Get started on a 30 Day self-directed recovery plan. Where are you now? Where do you want to be 30 days from now? 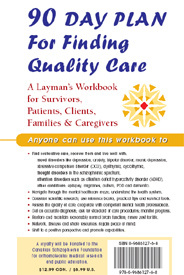 Explains how you can use the forms to find quality care. Note your patient and family medical and mental history. Are you getting R.A.I.S.E.? Or _______ ? What sort of care do you want? You can summarize your healthcare choices and plan your patient work for the next 30 days. With a good plan, you can find care, you can recover and you can keep well. You can check out your progress. 7. Mental Healthcare Compass: In which direction are you heading? Where do you want to go next? You can plan your search so you find proper care. 8. Visits with Health Professionals: You can make brief notes to document your sessions, your progress, your problems, your recommendations and your results. You can detail your assessments, your treatments, the effects and your results. The more detail you can note, the more you can help yourself find quality care. Is your care minimalist, conservative, restorative or _______? Are you cooperating with your caregivers? Are they helping you to find effective care? Or, are things going sideways or backwards? A patient can use TAYO to indicate his or her position with respect to attitudes and efforts, symptoms and side effects, diagnosis and treatments. A patient can discuss this with family members, caregivers and health professionals. Indicate what is happening with respect to your diagnosis and treatments. Use the planner to coordinate, organize care and cooperate with your caregivers. You can show them your TAYO form and you can ask for accurate diagnosis and restorative treatments. After 90 days, you will have a clear picture of your situation, with back-up documentation which you can discuss with your family, caregivers and health professionals. If you are a sick patient, depressed and discouraged, feeling helpless and hopeless, never quit on yourself. One day at a time, you can get better. If you are a family member or a caregiver, never give up if a loved one has a mental disorder. Restorative treatments are available. If you are a frustrated health professional, never stop working on your patient. Follow your practice guidelines which recommend accurate differential diagnosis and effective restorative treatments. After his interviews with 150 depression survivors brought to light coping concerns and common problems, Sealey developed tools for patients, family and caregivers. He offers a mental healthcare compass, practical tips, avoidable traps, checklists, worksheets and even a healthcare planner. We expect a credible workbook from a writer whose Bachelor of Science degree included courses in biological and medical sciences and psychology. Still, we wonder what motivated Sealey. How did he find mental healthcare that is consistent with the practice guidelines of psychiatry and applies the life science of biochemistry restoratively for clinical purposes? What did he discover by probing the health system? Why did he decide to help patients find quality care? By writing about mental healthcare in a direct and uncompromising manner, Sealey questions psychiatric minimalism. Noting that competent mental healthcare involves more than labelling and drugging sick people, he advocates for accurate diagnoses and effective treatments. His tips, tools, teaching tales and references educate readers about the practice guidelines of psychiatry, standard of care procedures and restorative orthomolecular medicine.